Natural honey is found in a thick liquid form and is sweet in taste. In India it is also known as Madhu and Shahad in Hindi. Honey is made by honey bees by using nectar of the flowers. Honey bees transforms nectar of the flowers into honey via a process known as Regurgitation. Natural honey is a great source of energy and sugar without any additional additive or flavor. Bees store honey as a food reserve to use in cold weather or during times when food availability fell short. Collection of honey from a bee’s nest inside the forest has been happening since ancient times. Honey bees make honeycomb at some high place mostly on the trees around some water body. The process of collection honey from the wild honey comb is quite dangerous as there are always chances of stings from honey bees. So, to collect honey people divide themselves into groups to two or three and began the search at night. All of them wrap themselves in clothes from top to bottom and use camphor to ward off the bees. At first a person uses a long, sharp wooden stick to penetrate the honey comb and check if the honey is ready inside or not. The wooden stick is them examine to see if the honey is mature enough for extraction. If the honey is ready for extraction, then one person creates smoke to ward off bees from the honeycomb. Then another person climbs and cut the honeycomb with a sharp knife or any other instrument. Then the whole honeycomb is collected in a basket and then the honey is collected from the honeycomb. To get the honey out of the honeycomb, it is pressed by hand and filtered twice or thrice. Honeycomb has different pores that contain honey. Natural honey itself has unique flavor, so, doesn’t require any artificial flavor or preservative. Honey is also produced at farms by beekeepers. But this honey is not natural as most of the honey is created by honeybees by using the sugar provided by the beekeeper. Natural honey is one of the best natural treatment for cough. 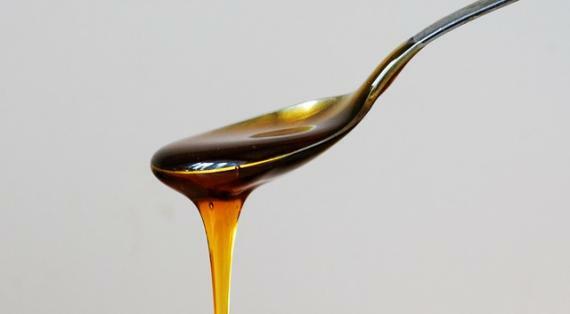 Using a mixture of natural honey with ghee is quite effective in treating cough. Do not use the same amount of honey and ghee together as it is not good for health. This remedy can be used for any type of cough and using this mixture about 3 to 4 times a day can help significantly in reducing cough. Natural honey is used for weight reduction also. In the Ayurvedic system of medicine, natural honey is also a main ingredient for many medicines. For losing weight honey can be used every day with hot water. Use the mixture of honey and warm water every morning before meal to get best results. Some people also use honey with lemon juice to get faster results. Honey is also used as eye toner. Many people apply honey to their eyes to improve eyesight. It has natural eyesight improving properties. Honey also has strong healing properties, so it is widely used to treat wounds. It also acts as best heart tonic and blood purifier. According to Yoga Guru Baba Ramdev taking a spoon of honey daily helps in attaining long and healthy life. In summer, honey can also be used as a delicious and healthy drinking by mixing it with water and milk. Honey is a good source of energy. It contains many vitamins and vital nutrients that are useful in keeping your body fit. Honey also offers effective health solutions and display unique medicinal properties so it is quite effective in treating diseases like mouth ulcer, night blindness, dysentery, paralysis, malaria, tuberculosis, pyorrhea, skin disorders and infertility.